Farrar Straus Giroux, 9780374219079, 218pp. A true story of obsessive love turning to obsessive hate, "Give Me Everything You Have "chronicles the author's strange and harrowing ordeal at the hands of a former student, a self-styled "verbal terrorist," who began trying, in her words, to "ruin him." Hate mail, online postings, and public accusations of plagiarism and sexual misconduct were her weapons of choice and, as with more conventional terrorist weapons, proved remarkably difficult to combat. 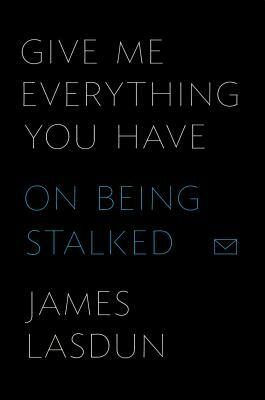 James Lasdun's account, while terrifying, is told with compassion and humor, and brilliantly succeeds in turning a highly personal story into a profound meditation on subjects as varied as madness, race, Middle East politics, and the meaning of honor and reputation in the Internet age. James Lasdun was born in London and now lives in upstate New York. He has published two novels, as well as several collections of short stories and poetry. He has been long-listed for the Man Booker Prize and shortlisted for the "Los Angeles Times," T. S. Eliot, and Forward prizes in poetry, and he was the winner of the inaugural BBC National Short Story Award. His nonfiction has been published in "Harper's Magazine," "Granta," and the "London Reviewof Books."